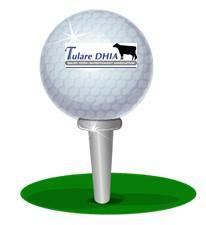 On Friday, May 4, 2018, Tulare Dairy Herd Improvement Association will be hosting its 25th Annual Golf Tournament. The tournament is open to our association members and any other dairy-related individuals interested in a relaxing afternoon. We are again inviting our association members and friends to participate in ways other than Playing in the match.Each year, we offer the opportunity of hole-sponsorship to all interested parties. The $100.00 sponsor’s fee includes an 18” x 24” sign placed prominently in the tee area and written sponsor acknowledgement in the Annual Report and at the registration area. We are again giving you an opportunity to award a prize on one of our special holes, i.e. longest drive, closest to the pin, etc. As is the case each year, proceeds in excess of the costs and moderate winning team prizes, will benefit the Tulare Dairy Herd Improvement Association Scholarship Fund for high school graduates in the area. This year Tulare DHIA awarded 8 $400 scholarships to local students and the 10th Annual Max Corbett Scholarship of $800.The sponsorship Application on the reverse side of this letter should be completed and mailed or faxed to Tulare DHIA at the address shown above by April 30 2018. A tournament entry form is attached. Make as many copies as you need.Thank you again for your support in prior years and we look forward to your involvement in this year’s tournament.